What a work van! This brilliant Express 2500 offers the capacity you need with the reliability and dependability of a new vehicle warranty...and all for thousands less than new! And did we mentioned the clean vehicle history with no previous accidents or claims. Why pay more when you can have this lightly driven previous daily rental vehicle that looks and drives like it just rolled off the lot. Priced to sell! Enjoy the convenience of power locks & windows, park in seconds rather than minutes with the rear vision camera and in-mirror display, keep your cool when its warm with front air conditioning, bring a partner or passenger along for the ride with two person seating, use the convenient 60/40 side door to load and unload items with ease, keep all your items close with the handy console complete with swing-out bin, never worry about mud and mess thanks to front & rear floor coverings, enjoy the smooth power of the 4.3L V6 engine with 8,600lb gvwr...and more! 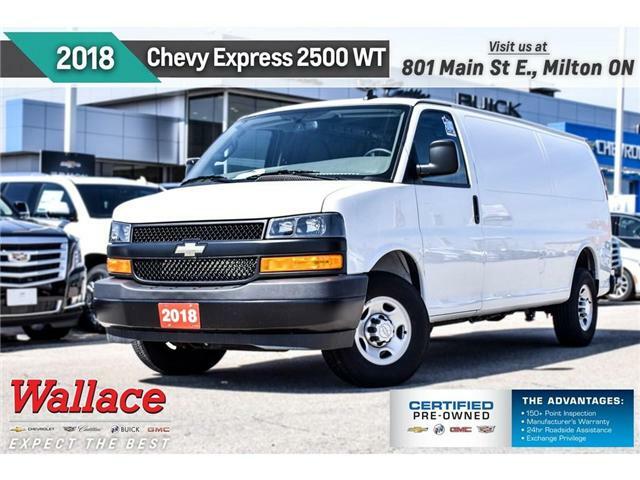 If you're looking for a commercial van this Express is tough to beat!